SACRAMENTO (CN) — California drought regulators introduced a long-term water conservation plan Wednesday that would tighten agricultural and urban water use restrictions to bolster the state’s dwindling water supply. The proposals would create new water conservation targets for the Golden State’s more than 400 water suppliers, force farmers to submit annual irrigation usage reports and ban residents from hosing driveways and overwatering lawns. The updated plan, “Making Water Conservation a California Way of Life,” comes six months after regulators relaxed strict conservation orders that required a cumulative 25 percent statewide savings target. Despite the historic, five-year drought, water suppliers and cities took advantage of the loosened restrictions and urban water use has spiked in the past four months as a result. “The last few years provided the wake-up call of all wake-up calls that water is precious and not to be taken for granted,” said Felicia Marcus, chairwoman of the State Water Resources Control Board. The proposal was drafted by a host of state agencies, including the water board, Public Utilities Commission and the Department of Food and Agriculture. Public comments are being taken until Dec. 19 and parts of the draft will require the Legislature’s approval. 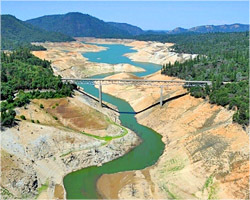 Officials said the plan is to “harness the creativity and innovation” residents have shown during the Golden State’s bitter drought. Despite heavy October rain, over 60 percent of the state is experiencing severe drought and last week the U.S. Forest Service said more than 100 million trees have died from it. Farmers and water suppliers were dealt another blow Monday as state officials announced that users would likely receive just 20 percent of their allotments from the State Water Project in 2017. While the final amounts will depend on winter rains and snow, the 29 statewide contractors last received 100 percent allocations in 2006. The water board is expected to announce October’s water conservation results within a week.